During the 1980’s and early 1990’s, there were several George A. Romero and Stephen King collaborations, Creepshow being the most successful of the bunch. These projects weren’t always the best the two men had to offer, but they were fun and inventive. The two of them first worked together on Knightriders and went on to collaborate on not just Creepshow but Creepshow II, Tales From the Darkside: The Movie, and the not very successful adaptation of King’s novel, 1993’s The Dark Half. It was not only the final film of Romero’s to be shot in Pittsburgh, but also the final project that King and Romero ever collaborated on. The story concerns Thad Beaumont (Timothy Hutton), a successful pulp novelist who has been writing a series of trashy novels under the pseudonym George Stark for years to great success. When he suddenly decides to lay George Stark to rest and write under his own name at the insistence of his wife (Amy Madigan), Stark suddenly appears as a real person (also Hutton), being somewhat of a bi-product of a brain tumor that was removed from Beaumont’s head as a child. Stark begins killing off anyone and everyone that gets in the way of keeping his name alive. 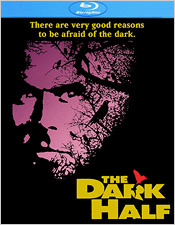 While Stephen King had little to no impact on the movie itself, George A. Romero wrote his screenplay using as much of King’s original novel of “The Dark Half” as possible. A couple of character changes were made, as was the ending, but it more or less translated well from book to screen, being one of the better King adaptations, in my opinion. The original novel is quite obviously based on Stephen King’s relationship with his pseudonym Richard Bachman, a name which he attempted to write under for many years until readers eventually caught on and realized that Bachman and King were one and the same. The story of The Dark Half takes that notion much further, going so far as to say that Thad Beaumont and George Stark share a psychic connection. And when they have this connection, thousands of sparrows begin to appear all around them, waiting for one of them to die and take them to Hell. So the details are a little fuzzy and come off a bit silly, but it doesn’t matter all that much in the scheme of things. It makes just enough sense and the performances are good enough that the overall plot isn’t in any real danger of losing ground. Speaking of which, probably the best thing about The Dark Half is Timothy Hutton’s performance as George Stark. He’s quite effective in both roles, but it’s Stark where he really gets to stretch and be a pretty nasty character. Michael Rooker is also surprisingly down-to-earth in his role as a small town sheriff with a strong moral fiber. Amy Madigan also does some good work as Thad’s wife, trying her best to remain strong for her husband, even when he’s accused of the murders that George Stark is committing. There’s a lot more going on in The Dark Half than what’s on the surface, which is what makes it a little more interesting. It isn’t the best material from George A. Romero, but it’s some of his more finely-crafted and more intriguing material. In the long run though, the performances are what really drive the movie and make it worth watching, more so than the special effects or the story, which is surprising. The movie’s debut on Blu-ray sports a very detailed image with a thick layer of grain on display. There are also some artifacts left behind here and there, especially during the main titles and transitions, but it’s to be expected. A lot of the visual effects, in particular the split-screens and early CGI, don’t hold up well under a microscope and are a lot more prevalent than they were before. Still, the image is quite strong with great color reproduction. Blacks aren’t all that consistent from shot to shot (this is a low budget film, after all), but contrast levels are very acceptable. The soundtrack, which comes in both 5.1 and 2.0 English DTS-HD, is a little on the flat side. The original soundtrack doesn’t really benefit much from being in a 5.1 environment as it’s more of a front-heavy presentation anyway, so I say just stick with the 2.0 track. Dialogue is always clean and clear, and both score and sound effects are mixed in together well. It’s not a great mix with lots of booming low end, but it gets the job done well enough. There are also subtitles in English for those who might need them. Also on this release, you’ll find quite a wealth of extras, which is great because I, for one, wanted to learn more about the making of this movie. There’s an audio commentary with Romero, moderated by radio talk show host Stuart Feedback Andrews; the newly-produced documentary The Sparrows Are Flying Again! : The Making of The Dark Half, a set of deleted scenes, including the original ending; two behind-the-scenes segments on the movie’s special effects and being on the set; a set of storyboards for the original ending; the movie’s original electronic press kit, as well as a set of vintage interview clips that were used for the press kit; the theatrical trailer; a TV spot; and finally, a still gallery. I would say that the biggest revelation out of all of this extra material would be the fact that Orion originally wanted to get either Willem Dafoe or Gary Oldman to play Thad/George. Just the thought of that is pretty amazing, not to take anything away from Timothy Hutton, of course.